Our trip home was uneventful . . . for the first part of the way. Though I have to say being out in the open air again is . . . utterly terrifying a bit uncomfortable for me still. I suppose I managed, though my hip and shoulder wounds are quite sore for wear. But it was the monorail ride that proved . . . more challenging after all. We were stopped and boarded by none other than the impressive Feanaro, son of Finwe. And though I was utterly terrified had great reservations about him fearing he might be carrying his brother's grudge against me, and though he definitely it seemed at first that he had plans to take control of the monorail and us, he turned out to be not such a bad chap after all, once you get him conversing a bit. So I can see a little of his lovely father in him, sans the blood-oath and Kin-slaying bit. Stunning hair, too, I should say. I do have to say I was rather surprised that he accepted the invitation to dinner. He hasn't told us his purpose yet, but I'm starting to wonder if it doesn't have something to do with Celebrimbor staying next door. At least I assume he's still staying next door; I haven't had the opportunity to inquire yet. I wonder if that's what Elanorelle was thinking about and if she has further ideas on it. She and Uncle Sennie seem to be enjoying each others company, so I haven't had opportunity to ask her yet. I am glad Grandmum had the foresight to make our ceiling in Back End higher than that of the average smial so Big People and Eldar guests need not stoop; she knows how much I like to entertain guests of all kinds. Though, of course, it's no where near as high as in her Geodesic Smial. Still, the ceiling probably feels a bit low to Feanor. But he does seem to be interested in that which is different from what he is used to, so hopefully the closeness is not oppressive to him. In any event, I am very glad to be home. It's been a while. And to have Elanorelle back with us as well. There is much to be thankful for. We ran into a couple of old friends on the walk back from the station I was very glad to see. I wonder if they'll join us for dinner. I'm not sure what Pippin and Merry are up to either, and if they'll join us. Still, that will be a little while yet--I just put the mushroom pie in the oven. But for now, tea is ready, so our Noldor guest can get a taste of how we serve it in the Shire. 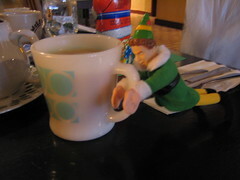 And we even have--oh, they spelled it wrongly--some Elven tea, if he'd prefer. 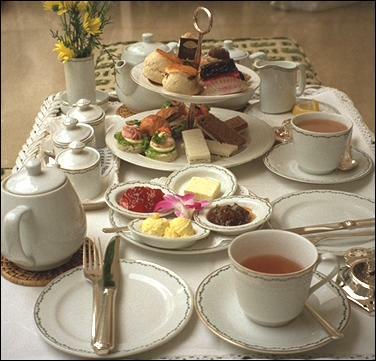 *sets out the tea and biscuits on the dining room table* Tea is served everyone!